Many years ago Reinhold Stumpfl was a distributor in Austria for AVL. But getting synchronization between technologies had always been an issue. After several years of research, Wings Platinum 2.40, the multidisplay production and presentation system was acknowledged the world over for its wide range of functions and high performance in presenting incredible shows. The new Wings Platinum 3 comprises numerous new features largely focusing on simplicity of show production and live interactive applications. The completely redesigned user interface comes with a new keyframe editor and a very comfortable and powerful in-screen editing tool. AVStumpfl's new Wings Platinum 3 achieves total synchronicity with its new features. Franklin Moore, AVStumpfl's U.S. sales manager, said, "Wings is a production tool and it can become a presentation tool. This single set of software, with our integrated hardware set, is the first comprehensive and completely solution. It's really a powerful software tool, very broad in its functionality." Wings is a timeline based audio, video, and show editor as well, with full preview on the master and an unlimited number of cross-fade layers/PiPs with keyframe control of alpha, size, aspect ratio, position, 3D rotation, and coloring offer the full range of possibilities for astonishing productions. Realtime rendering and live interactive layers with flying PiPs via DMX and MIDI remove the boundaries for interactivity in live shows. Frame-accurate synchronization between multiple systems via smart-sync-engine over TCP/IP network ensures an image on a limitless number of display devices. Unlimited pixel resolution, free arrangement of the displays, seamless soft-edge blending horizontally and vertically, and warping provide no restrictions to your creativity. Moore continued, "People that come to our booth and can't believe it. There's a complete solution for all facets of multidisplay, video, and video streaming that knows no resolution. You can compose and create in Wings in any resolution you want, you're only limited by the output device. And you can do this with soft edge blending and warping, even 360 degree warping. You can mold a moving image on a sphere and simultaneously make the sphere move around, because whatever you program in our software is 100 percent synchronized with all other functions." Wings Platinum 3 supports all important image and video file formats with full alpha channel support and playback of HD+ content via split-rendering technology. The complete show can be rendered to MPEG, WMV, AVI, or written directly onto DVD for further distribution. Masking and chroma-/luma-keying can be used for pre-recorded content as well as for multiple simultaneous live video inputs. Users can utilize any display, such as plasmas, LCDs, LED walls, stationary or moving projectors, even mixed, and turn them into one huge overall experience. Multidisplay presentations with several networked computers for projection of huge pictures and videos in realtime. To do this, Wings Platinum uses a presentation network with one master and any number of presentation computers for realtime projection of multidisplay presentations. Wings Platinum features numerous speaker support functions for a perfect combination between a composed show and the live comments of the presenter. Using the pause and start commands on a remote control, the presenter can control the pace and flow of the presentation themselves. Free running audio and video playback provide background music or image display during the moderation. Automute objects ensure that the show is perfectly in sync with the live act and the presenter themselves becomes a part of the show. HD Audio up to 24Bit/96kHz, 24 output channels and timeline based editing with realtime DirectX audio effects are unmatched tools to draw people's attention. Every show has a minimum of one timeline containing layers for arranging the media objects. Several timelines are appropriate for interactive or multilanguage shows. Show control for permanent installations or events requires several timelines for the arrangement of complex projects. Jumping between timelines during a show allows interactivity.Live VGA and video signals up to HD resolution can be presented in realtime and incorporate in the show. A total of 8 live video channels combined with alpha channel masks and croma/luma keying allow for unlimited possibilities. Featuring full show control capability, it can output DMX512, MIDI, 0-10V, RS232/485, switches, TCP/IP, UDP, etc., in sync with the show, of course. Recording, editing, and playback of DMX512 light shows are supported as well. Wings Platinum features a toolbar similar to those of other professional editing programs. In combination with keyboard shortcuts, operation is very time-efficient and effective. The option to arrange all windows and menus on one multi-screen workplace allows you to keep track of your production. WINGS PLATINUM 3 can be controlled using the wireless SC TOUCHCONTROL or via RS232, TCP/IP, DMX, MIDI from any other system. Moore said, "You can set up Wings to control DMX outputs from 0-10 volt inputs or the other way round and also use MIDI as input as well that will allow you to program all kind of hardware through our software. Once programmed our software can be played back from a computer either inside or outside of our hardware devices to achieve multiple functionality. You don't even need to worry about SMPTE, you just program in our product and SMPTE generally becomes a non-issue." 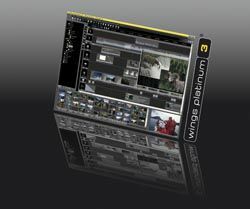 WINGS PLATINUM 3 is available as software only or as a turnkey solution in combination with the SC MEDIA ENGINE. For more information www.AVstumpfl.com.